Modern upholstered wicker set. Includes sofa, chair, settee, end table and cocktail table. Tables have smoked glass tops, circa 1980s. 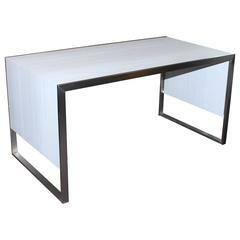 Parsons desk or table. Textured linen style laminate and brushed stainless steel. A round dining table of Lamb's. It has the cylindrical or tubular base. 6 available. 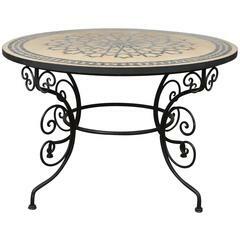 Large French round faux bois garden table. 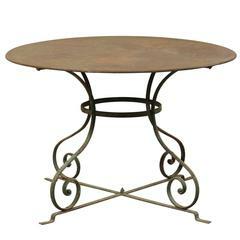 French round faux bois garden table, beautiful patina. 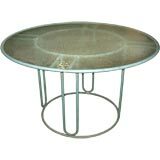 A French bistro table with circular bakelite top and green painted iron legs.